I had a 1974 RoW 914 2.0. Yes, right front fender for the radio antenna. Not sure it makes a lot difference unless you plan an 'as delivered' restoration. As I recall the fuel pump did not get moved to the front (on the 4 cylinder cars) until 1975. In it's location in the rear it could get pretty hot and occasionally vapor lock. I had a 74 and it was next to the heat exchanger (under the battery as I recall) - on a 914-6 I am not sure. 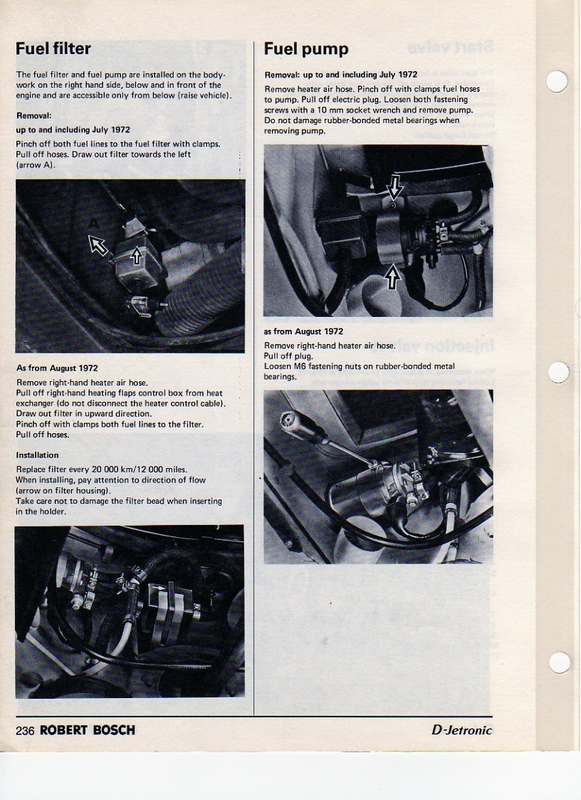 However 911 with Factory AC had sometimes Manual Areal on the Passengerside. VW 914 (Type47) made at Karmann had Areal always on driverside but if the Type 47 came without Radio the Dealers installed the Areal where ever they wantet so most Porsche Dealers put the Porsche Areal shema to the VW as well. VW Dealers didn´t know. I guess Brett Johnsons Book to Authenticy covers that detail. 914/6 Fuelpump sits on the same location as all 914 Fuelpumps up to 1974, on the Passengerside underpancorner close to te bulkhead ( See the cable running trough the sheetmatl in the bay). That spot is close to the Blow Off Opening from the RHD Heatexchanger Valve and so that corner can get very hot and adds Vapor to the Fuelsystem. Most 914 Specialist relocate the Fuelpump to the 1974 on loctaion under the Fuel Tank. Some relocate them to the same position like the 911 Fuelpumps boltet to the front axle carrier wich is simple if swaped to the 1974 on Alloy Steeringrack Carrier. The original Location needs high wind volumes to soak the heat away wich didn´t work in Stop&Go or while cruising in hot Staates. While new Fuelpumps can handle vapour aged fuelpumps hit vapor lock. Due the other heat excahnger and Heat Valve location Vapor Lock was not a 914/6 Problem in ROW. It only happend in Hot Areas and mostly aided by poor fuel and aged fuel systems. However the 914/4 had soon Vapor Lock in the USA and in Germany as well. - Remove heat valve and weld a 90" Pipe on the Valve to run the heat downwards and reinstall. The problem from that "fix" was to much wight on the valve vibratet the valvebody from the exchanger so on 914/6 you either made a weldspot or use a rivet to secure the valve on the heatexchanger. On 914/4 the engine carrier crossbar made possible to add a pressed Foam strip between carrier and Heater valve avoiding to fall off. - only on FI Cars, add a fuel cooler to the fuel returnline, this part was aviable at Mercedes Benz or was "selfmade".